Inspired by Frank Lloyd Wright and designed by a visual artist owner this Prairie style home is like no other. This five bedroom home on full basement offers an open & airy floorplan w/ natural light flooding the interior. Hardwood flooring throughout foyer, living room, eat-in kitchen and dining area. Built-ins, window seat & gas log fireplace are just a few things highlighting the large living room. The huge eat-in kitchen is a cooks delight w/ maple cabinets and counter space galore, island that seats 6, walk-in pantry & planning desk. 2nd-floor master suite w/ walk-in closet and private bath. Laundry room conveniently located on the upper level. Roomy basement offering media room, bedroom & dance studio. Enjoy the gorgeous views of the landscaping & nearby lake from the deck w/ pergola. Bright & beautiful home with breathtaking views. This home has everything; Spacious wood floor foyer, a living room w/ a fireplace & an abundance of windows. A completely remodeled kitchen w/refinished hardwood floors, quartz countertops, a huge center island, 1yr old stainless steel appliances, and a closet pantry. A large family room has been added to this home & features a gorgeous wood ceiling, brick front fireplace flanked by built-ins & an abundance of natural light. Enjoy your surroundings in the screened porch or patio. 1st-floor master suite w/ nook, 2 walk-in closets & huge master bath w/ tile floors, jet tub, dual vanities & separate shower. 2nd floor features another master suite w/ private bath, 2 additional bedrooms share a full bath and a den/playroom complete the 2nd floor. All new carpet, freshly painted & new light fixtures throughout. New commercial 80-gallon water heater. Over 5 acres w/ a private pond, beautiful landscaping & many trees. A MUST SEE HOME! Stunning 1.5 story home in Chestnut Grove Subdivision, situated on a corner lot, offers a great open floorplan. The foyer featuring hardwood flooring ushers your guest to the open concept living space where the hardwood flooring continues into the living room with vaulted ceiling and fireplace flanked by windows. Adjacent is the spacious eat-in kitchen with large working island with seating, granite countertops, tiled backsplash, and stainless steel appliances. The formal dining room would also make a great office space. You will enjoy the private first-floor master suite with a walk-in closet and large master bath. Upper level features two bedrooms sharing a full bath plus a third bedroom with a private bath. The basement offers a huge family room, three additional bedrooms, and two full baths plus storage space. Upgraded lighting throughout the home. The extra deep 3 car attached garage features enough space for storage or play plus has a 1/2 bath. Gorgeous five bedroom home situated on the water in Trails at Brittany Subdivision. Spacious entry with hardwood floors leads to the beautiful living room with soaring ceiling and an abundance of natural light thanks to the floor to ceiling windows overlooking the water. The gourmet kitchen is a chefs delight with SS appliances, granite and custom cabinetry. The formal dining room with hardwood floors is perfect for your entertaining needs. As the owners, you will enjoy the first-floor master suite with private bath and walk-in closet. Three generous sized bedrooms and full bath complete the upper level. Continue your entertaining needs in the full finished basement with large bar area, sitting area in front of the 2nd fireplace, game/rec area, family room area, 5th bedroom and full bath. Other amenities to enjoy: oversized 3 car heated garage, new HVAC & water heater in '15, central vac, built-in sound system, irrigation system, whole house humidifier, and so much more! Stunning custom built home located on the Sangamon River with over 3 acres! The spacious foyer, open layout, and beautiful finishes welcome you into the home. Enjoy entertaining in a kitchen that offers everything you could ask for! Great lighting, beautiful views, eat-in bar, pantry, stainless steel appliances, and more! The first floor Master Suite features a large walk-in closet, sitting room, walk-in shower and dual vanities. The main level also offers a laundry room, mudroom, and two car attached garage. Two bedrooms, a full bath, and walk-in attic complete the second floor. Great storage space or room for future possibilities are offered in the basement. This home sits on a beautifully landscaped wooded lot and the large outside deck overlooks the river. This home has it all! Your very own country retreat! Situated on over 5 acres, this custom built raised ranch home with five bedrooms and three full baths will appeal to even the most discerning buyer. The architectural design maximizes efficiency and nature viewing. With over 4500 square feet of living space, no detail was overlooked in construction, from the imported Travertine stone flooring and North Carolina natural hickory hardwood flooring, solid wood cabinetry and doors, interlocking siding, 2X6 construction, super insulated, geothermal, 400 amp electrical supply, prewired for audio, entertainment & internet, full exercise room/gym with sauna, oversized 3 car garage (1080 sqft), 24X48 barn, horse friendly, nature trail and 35+ pines trees. This home is a one of a kind and a must see! New Construction in sought after Thornewood subdivision. Limited selection setting with views of the woods and walk-out basement. Grand open and split floor plan with master separated from the other bedrooms and cathedral ceilings are found on the first floor. The gourmet kitchen has a sleek modern flair with white cabinets and black stainless steel appliances. Large walk-in pantry too. The daylight basement has 9ft ceilings and wet bar. As well as, extra bedrooms and full bath. Large covered porch is great for enjoying the outdoors. Thornewood subdivision has great pathways throughout and a park including kids climbing area and swings, as well as, a frisbee golf course. The new section of Thornewood also has a pond. Close to the lake of the woods, this is a great location to experience the topography and woods that Mahomet provides. There is so much to love about this custom built home situated on 5 acres! Over 3700 fin. sq.ft. of living space w/ an open concept 1st-floor layout including the 2 story living room w/ an abundance of natural light, balcony access & floor to ceiling stone fireplace. The cook of the house will love the newly updated kitchen w/ high-end SS appliances, hickory cabinets, quartz countertops & bamboo flooring. Retreat to the first-floor master suite w/ bay window, walk-in closet & master bath. Two additional bedrooms, full bath & 13x30 climate controlled unfinished bonus room completes the second floor. Even more space in the partially finished basement offering a huge family room w/ access to the brick paver patio. Fourth bedroom, full bath & dog kennel room w/ raised tub & separate access to fenced yard completes the basement. All of this plus Geothermal HVAC, whole house fan, storage space throughout all levels & walking easement to a 26-acre common area along the Sangamon River. Located in Lake Falls Subdivision, this four bedroom home is only 3 years old, has beautiful west facing views and offers approx. 3100 total finished sq.ft. The exterior has a cedar shake look but is low maintenance vinyl siding accented by stone. The main level has hardwood throughout and cathedral ceilings in the main living area. The open floor plan to the kitchen, accented by beautiful granite counters, stainless appliances, and maple cabinets, is great for entertaining. A walk-in pantry for extra storage too. Split floorplan for the bedrooms with the master suite having a large 14x6 walk-in closet and convenient access to the laundry room. The finished basement holds a huge rec area complete with wet bar. The fourth bedroom and full bath also found in the lower level with an additional area for a future bedroom or office. Enjoy the sunsets off the covered porch overlooking the fenced backyard. Stunning four bedroom ranch in The Trails at Abbey Fields Subdivision offers approx 2900 finished sq.ft. The charming covered porch welcomes your guests into the spacious foyer which ushers them into the great room with cathedral ceiling, hardwood flooring, and gas fireplace flanked by large windows. Eat-in kitchen with roomy dining area has hardwood flooring and sliding door leading to covered back porch. As the owners, you will enjoy the privacy that the split bedroom floorplan creates. Large master suite with cathedral ceiling, walk-in closet and private bath with dual vanities, tub, and separate shower. Mud room/laundry room off of the 3 car garage is the perfect drop zone for everyone's things. Full basement provides a spacious rec room with wet bar, full bath, and 4th bedroom, office/den plus lots of storage space or future living space. The covered back porch is surrounded by a brick paver patio with built-in firepit will be a great place to entertain spring/summer/fall. Stunning home in sought after Thornewood Subdivision offers 4238 total finished sq.ft & sits on a 1+ acre lot. All main floor living spaces feature newly refinished Brazilian cherry hardwood floors including the office w/ adjoining bathroom. The formal living room & dining room makes entertaining a breeze. The cook of the family will appreciate the details in the eat-in kitchen including the cherry cabinets, granite countertops & stainless steel appliances. Retreat to the luxurious master suite w/ walk-in closet & private bath. Three additional generous sized bedrooms and full bath complete the upper level. The full basement offers 1027 sq.ft. of finished living space including the huge rec room, full bath & 5th bedroom. The outdoor space is just as great as the inside; the back deck & brick patio is the perfect space for friends & family to gather for BBQs. An amazing basketball court, invisible pet fence & professional landscaping complete the yard. Nothing was overlooked! Quality construction built in 2013 by Armstrong Builders. This bright and beautiful 2 story home offers five bedrooms, three and a half baths, and an open floor plan with approx. 3300 total finished sq.ft. Eat-in kitchen with hardwood floors, island with seating, walk-in pantry, stunning white cabinetry, and stainless steel appliances. The first-floor flex room with hardwood floors is the perfect office/den space. Enjoy the views from the sunroom of the oversized backyard. The second-floor master suite features a cathedral ceiling, huge walk-in closet and master bath with dual vanities, tub and separate shower. Three additional bedrooms and laundry room complete the upper level. The basement offers a spacious family room with fireplace, full bath, 5th bedroom w/ walk-in closet and storage space. Drop zone with lockers off of the 3 car attached garage. A must see home, call today to schedule your private showing! Stunning four bedroom, three and a half bath home with full basement in the desirable neighborhood of Beringer Commons! Entry with hardwood floors leads your guests to the beautiful open concept living space. The living room features a vaulted ceiling, large picturesque window and fireplace flanked on both sides with built-ins. The cook of the family will enjoy the large adjoining kitchen with working island, granite countertops and an abundance of cabinets plus an additional area for dining with a plethora of natural light. The master suite it secluded thanks to the split bedroom floorplan and offers a private bath with dual vanities and walk-in closet. In the daylight basement, you will find a giant recreation/family room, sitting/bonus area, fourth bedroom, full bath plus plenty of storage space. The Trex deck will be perfect this summer/spring to relax or entertain. Tankless water heater, double sump pumps, and Pella windows are just a few other amenities. A must see home! Bright, beautiful and brilliant! This custom built home is situated in the new Harvest Edge Subdivision and offers 3495 finished sq.ft., five bedrooms, three and a half baths and a partially finished basement. Natural lights floods the interior and welcomes you to discover the fine finishes that include hardwood floors, custom blinds, crown molding, tray ceilings & much more! The eat-in kitchen features Quartz countertops, soft close cabinets, glass backsplash, island with seating and stainless appliances. The private master suite offers a walk-in closet and a full ensuite bath with dual vanities, fully tiled shower w/ a custom bench and separate tub. The full basement offers a finished family/rec room, wet bar, full bath, two additional bedrooms plus 1000 sq.ft. of unfinished storage space. Fully fenced backyard, beautifully landscaped, oversized 3 car garage and vinyl siding that is UV protected are just a few more amenities you will enjoy. Call today! Elegant three bedroom, two and a half bath carriage style home with land, great charm, and breathtaking views! You are welcomed into the home with a two story staircase and foyer area. The kitchen provides many Schrock cherry cabinets, walk-in pantry, center island, and access to the patio. This home features three fireplaces, built-in security and fire alarm system, laundry room, and much more! The spacious Master Suite is a dream featuring a fireplace, walk-in closet, great natural lighting from the windows, and relaxing bathroom with skylight. You will enjoy entertaining in the many spacious areas of the home! Two-car attached garage and two-car detached garage with work bench, space for tools, and second-floor storage. Schedule your showing today! Make this planned new construction yours. This home offers an open floor plan with an island kitchen and pantry closet. The family room, with high ceilings and hardwood floors, will be a great place to visit with friends or family. As the owners, you will enjoy the very private master suite with walk-in closet, easy access to the laundry room and master bath with dual vanities thanks to the split bedroom floorplan. The large recreation area in the basement will be a wonderful place to entertain. The drop zone with lockers, located off of the 3 car garage, is the perfect place to drop your things from the day. Be the first to own this quality construction by Armstrong Builders. Remarkable three bedroom, two and a half bath home with full basement located next to a pond and on a cul-de-sac! Spacious entryway with two-story staircase, eat-in kitchen with white cabinets, granite countertops, breakfast area, and flows nicely into the dining room. Located directly off of the kitchen is the 14' x 20' screened porch with peaceful views of the pond and beautiful scenery surrounding the fenced in private backyard. The land also features a 14'x14' shed, professional landscaping, and mature trees. The Master Suite features a bedroom with vaulted ceilings, two walk-in closets, bathroom with bathtub and separate shower. Convenient and spacious laundry room with abundant storage, two other well-sized bedrooms and an extra bath complete the upstairs. Home is adjacent to Commons and Woods, new basement carpet in 2017, new garage door openers 2018, furnace and air conditioner inspected in 2018. Don't miss out on your chance to see all that this home offers, a must see! Rare opportunity to own a home located on the highly sought after Urbana State Streets. 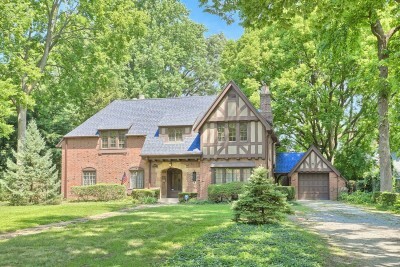 This three bedroom Tudor style home is filled with old world charm with splendid architectural detailing and many built-ins can be found throughout. Details include arched doorways, original hardwood floors & crown moldings throughout, beamed ceiling and window seat flanked by alcoves with built-ins in the large living room, gracious dining room, the study offers an abundance of built-ins and is the perfect place for quiet time. Three generous sized bedrooms upstairs, all with hardwood floors. The full unfinished basement provides great storage space, laundry room and full bath. Retreat to the lush green backyard with mature trees and privacy fence for your own park-like setting. Newer roof. This home is close to campus, shopping, dining and parks. This home is a must see! Wow, this stunning custom built home is exceptionally clean, invitingly decorated & offers 3300 sq.ft. of living space. Natural light floods the interior & welcomes you to discover the fine finishes that include Schrock cabinets, ceramic tile in kitchen, wrought iron banister, warm hardwood floors & much more! The vaulted ceiling living room w/ gas fireplace is the perfect place to enjoy your family & friends. The sunroom/family room offers access to the oversized Trek maintenance free deck overlooking the well-landscaped yard w/ separate paver patio against the tree lined lot. The first-floor master suite offers hardwood floors, walk-in closet & private bath w/ separate shower. Two generous sized bedrooms and 2 full baths complete the upper level. The finished basement features a rec room & bonus room w/ french doors & closet, both w/ wood laminate flooring. Extra large 2 car garage w/ ample space/depth to park 3. This home is ready for you to move right in! Armstrong Builders presents The Austin II plan to the newest phase in Fieldstone Subdivision. This 2-story home features four bedrooms, three and a half baths and approx. 2667 finished sq.ft. Spacious entry with coat closet leads to the open concept living space featuring the living room with fireplace and eat-in kitchen with island and corner pantry closet. Drop zone with lockers and half bath located off the 3 car attached garage. The second-floor master suite boasts a vertical rise tray ceiling, 6x15 walk-in closet and private bath with separate dual vanities. Two generous sized bedrooms with walk-in closets, full bath and laundry room with utility sink complete the upper level. The full basement is finished with a spacious family/rec room, fourth bedroom, full bath, and storage space. Call us at (217) 355-0700 or send us an email.